All these profit off elections, and the more divisive, the more angry and contested, the more money is made. Every one of these works to make sure things stay as they are. They have to, it’s their income. We are told that voters are unhappy with Congress, with politicians, and with money in politics, but many people benefit from the system as it is, or think they do. Work for a defense contractor? They buy at least $27 million in influence in a presidential election year.Belong to a union? The union buys influence through backing candidates and keeping incumbents in office (most of the time). The biggest contributors may be unfamiliar companies, and some are simply special-interest organizations. You may work for some, or you may agree with their aims, and they buy influence. The number one in 2016 was Fahr LLC, which is privately owned by Thomas Fahr Steyer, a billionaire hedge fund manager. It (he) donated $90 million to Democratic Party candidates. It’s reasonable to believe there are expectations that go along with it. Even local groups like police and fire departments have to endorse one of the two parties, or there will be payback later. Federal money can reward local agencies that go along with the system. A charitable organization can lose grants if they lose key contacts. This is all the same as big business, where a simple comment behind closed doors can kill an entire program. I’ve seen it firsthand. Have you heard of a distributor? Large companies that sell to small businesses do it through distributors, usually regional, so a brewery doesn’t sell beer to each convenience store, it has an arrangement with a much smaller number of distributors, and each of those sells beer to the stores. I’ve worked with other kinds of distributors, and it’s a great way to simplify business and give better service to individual stores. The Democratic and Republican parties work the same way as distributors. They take money from donors and deliver the policies the donors want, or try to. Some donors, like the National Association of Realtors, donate about evenly to both parties so they have influence no matter which party wins. Those in Congress who belong to a Party must engage in fundraising, and this can take a lot of time. Lobbying organizations can coordinate with political parties to manipulate the government, and there appears to be no way to stop them. Party leadership isn’t elected by the people, it’s selected by the ability to acquire money and control their “employees,” the politicians. It’s controlled by those with wealth and power. It’s a big business, and that’s not right. And it’s the root of our problems today. Reform efforts are ineffective because the politicians aren’t going to work against their own sources of power and wealth. True reform has to come from the people via the ballots. But as we’ve seen lately, social media giants want to shape America, too, and they will quash reform efforts that threaten their influence. It’s not a conspiracy, they just all want the same thing: wealth and power. Independents are rare because they don’t play in this system. Their influence is not valuable to business or special interests, especially because they require individual attention. Donating to a Party means that Party’s own management, and whip, will deal with the candidate or Representative on behalf of the donors and can punish any that don’t deliver product by cutting off funding or endorsing someone else. Lobbyists like Planned Parenthood and the NRA are exceptionally powerful and both can destroy a political career if the politician doesn’t obey. The two political parties can spend as necessary against a candidate that won’t toe the line, or against an independent if needed. This was more visible in the 2016 election. Sometimes, a Party will spend to support the “right” candidate in the other party, or to split the vote in states with a top-two primary with the result that one party is completely blocked out of the general election. In 2016, CA District 46 voters only had Democrats to choose from in the general election (and for U.S. Senator as well). 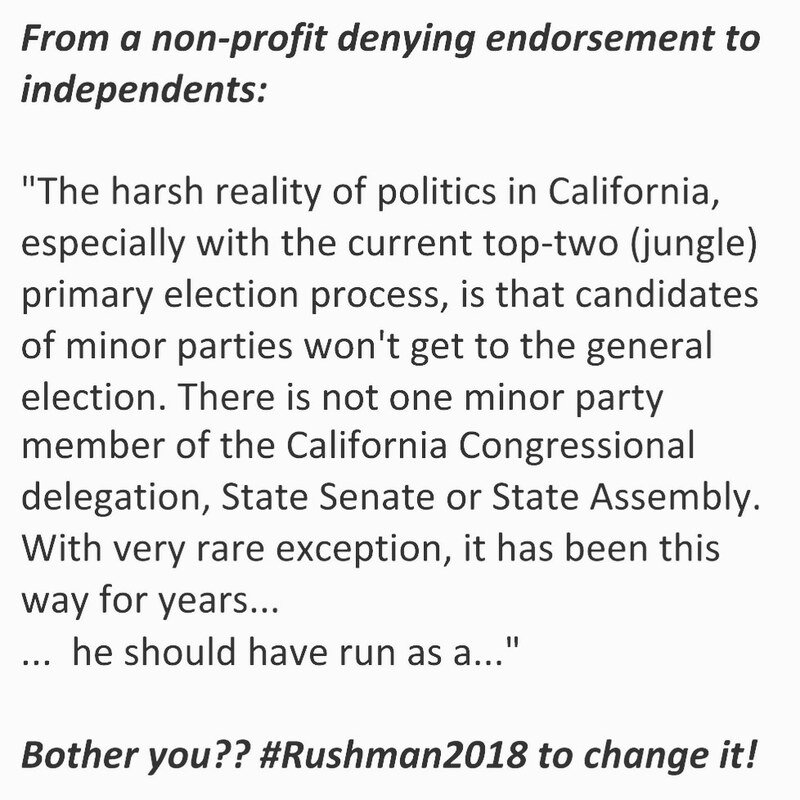 I’m running as an independent, and while I could run with a Party and try to reform it from the inside, I don’t agree with everything in either party, especially the most extreme views enforced by wealthy special interests, and any congressional career would be short lived since I’d never follow the Party line. When two huge companies compete, they need to appear different and sometimes just split the market. This isn’t the case so much when they compete on price, but that doesn’t happen in politics. The two main parties each have their hot positions and they go more extreme over time. They don’t want to look alike, they want fanatical party members, and that means going to extremes. They both want to continue getting donations and holding office. Both use the same basic mechanisms to obtain money and produce the product donors want. It’s a new way of doing the same thing as kings and emperors did for thousands of years. The United States of America is supposed to be a republic, a nation of laws and good people, not kings, but we got lost along the way. We let business take over our government, and we have to make better choices to clean house. I’m running to give us a choice, to make a start at real change. Others are doing the same. Perhaps more will try. Please find these candidates and support them. The pressures to conform are enormous, and society is being shaped to reinforce the corrupt system. It’s a mess, but our Constitution was designed to provide a way out. I’m doing my small part, please vote, talk about it, and do what you can. We owe it to each other.